Chef Boy's BBQ Beef Skirt Steak is such a memorable dish it is guaranteed to give a delicious flavor to one's graduation memories that will last a lifetime. While it goes well with one's favorite fizz, it also settles quite well satisfactorily as luncheon or dinner fare. 1. Have ready heated charcoal griller. 2. Marinate beef in mixture of mustard, olive oil, crushed black pepper corn, rosemary, thyme, salt. 3. 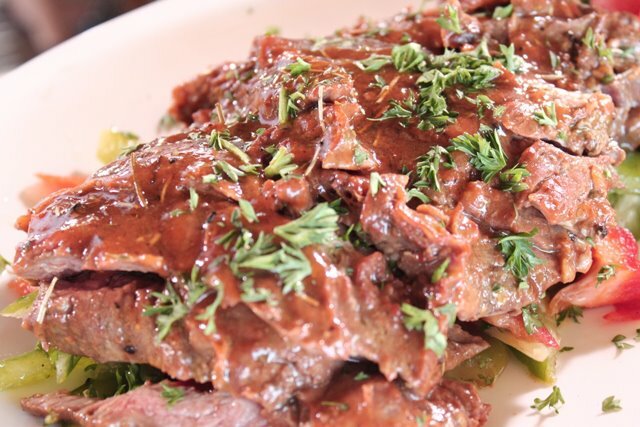 Place it on griller and baste with barbecue sauce until done or as per guest’s preference on doneness of the beef. 4. For the chilli barbecue sauce, combine all ingredients in a sauce pan, simmer for 30 mins. or until sauce reaches preferred consistency.